Harvard researchers Dongeun Huh, Don Ingber and the Ingber team on Friday (25 June 2010) published in Science an impressive advance in organotypic tissue culture that could someday be adopted as a viable alternative to animal experiments: a “lung on a chip” including both human cells and a bioengineered boundary layer that is both porous and flexible. The new chip overcomes limitations of previous 3-D organ models in at least two ways: both by recreating the body-environment interface featuring a multilayered set of membranes with communication across them, which in itself is remarkable enough, but also by allowing dynamic mechanical forces (think “breathing”) to be applied and showing the response. On a recent visit to Ingber’s lab, in the new and hiply designed Wyss Institute for Biologically Inspired Engineering at Harvard University, we got to see the device, a rubbery object more reminiscent of a clear pencil eraser than of a futuristic biochip. The lung-on-a-chip sandwiches a layer of epithelium and a layer of endothelium, both formed from living cells, around a flexible synthetic boundary layer. Vacuum chambers on either side provide stretching and shear forces that mimic those in real lung air sacs (alveoli). The cells find the environment so natural that they secrete surfactant, the normal coating found on air-contacting cells in the lung. This technology’s new attributes – responses to dynamic forces, use of translucent materials to allow for real-time observation and the ability for cost-effective mass production – make it truly stand out. The lung chip represents an interesting bridge between skin models, which are already in widespread use in both the pharmaceutical and the cosmetics industries, and realistic models of even more complex tissues like liver, kidney and heart. These results might also accelerate research on the engineering of replacement tissues for medical use. In a related article appearing the same day, Science published work from Yale professor Laura Niklason (scientific founder & CSO of a tissue engineering company called Humacyte focused on lab-grown blood vessel grafts) who reconstituted a rat lung in the lab by removing lung cells from a young rat, growing the cells up in a bioreactor and replacing them into the empty lung scaffold in the living animal. She was able to get the reconstituted rat lungs to breathe and behave consistently with normal lungs for a couple of hours. The lung stories made it big into the media. This well-written press release helped. For instance, the Science Friday show on US National Public Radio ran a 17-minute feature (once on the site, click on link at upper left for Podcast) and the Boston Globe put it on the front page. 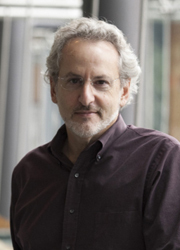 Ingber’s efforts do not stop there. In a lecture we heard him give at Harvard in March, he described efforts to develop “programmable nanomaterials” for implantation in the body. Other organs the institute is looking at include “peristalsing gut on a chip.” Tissue by tissue, organ by organ, Ingber plans over time to link the models together with “engineered channels carrying fluid” to create “a synthetic human on a chip.” Stay tuned for more news from the fast-moving edge of organotypic tissue culture. Here, we describe a biomimetic microsystem that reconstitutes the critical functional alveolar-capillary interface of the human lung. This bioinspired microdevice reproduces complex integrated organ-level responses to bacteria and inflammatory cytokines introduced into the alveolar space. In nanotoxicology studies, this lung mimic revealed that cyclic mechanical strain accentuates toxic and inflammatory responses of the lung to silica nanoparticles. Mechanical strain also enhances epithelial and endothelial uptake of nanoparticulates and stimulates their transport into the underlying microvascular channel. Similar effects of physiological breathing on nanoparticle absorption are observed in whole mouse lung. 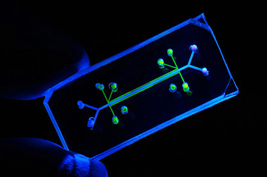 Mechanically active “organ-on-a-chip” microdevices that reconstitute tissue-tissue interfaces critical to organ function may therefore expand the capabilities of cell culture models and provide low-cost alternatives to animal and clinical studies for drug screening and toxicology applications. 1 Wyss Institute for Biologically Inspired Engineering at Harvard University, Boston, MA 02115, USA. 2 Vascular Biology Program, Departments of Pathology and Surgery, Children’s Hospital Boston, and Harvard Medical School, Boston, MA 02115, USA. 3 Department of Medicine, Children’s Hospital Boston, Boston, MA 02115, USA. 4 School of Engineering and Applied Sciences, Harvard University, Cambridge, MA 02138, USA. Scott Kirsner, the Boston Globe’s innovation columnist, on Sunday thoughtfully tackled the question of when the current IPO drought is likely to end. His piece, which makes a nice mention of CBT Advisors, is nominally focused on the Boston area but the sentiments are of course similar in other geographies. Here is an excerpt with a link to the rest of the piece below. Filing the paperwork for an initial public offering is like buying the perfect bathing suit for a beach party. Yes, you’ve taken the first step by finding something to wear, but you still need people to show up at the party and warm weather, too. Right now, the forecast isn’t phenomenal for the five Massachusetts companies looking forward to their day in the sun. One of the most recent local offerings, Aveo Pharmaceuticals Inc., a Cambridge biotech working on a drug for kidney cancer, had hoped to sell its shares for between $13 and $15; the shares debuted at $9 in March and have declined since to about $7.50. Despite the market conditions, a quintet of companies is lined up for their turn, representing diverse sectors of Massachusetts’ innovation economy: energy, consumer-focused services, life sciences, and technology. ■ Newton’s First Wind Holdings Inc. develops and runs six wind farms in states including Maine and Vermont, and has plans to build others; the company originally filed to go public in the summer of 2008, and it hopes to raise as much as $450 million, using the clever ticker symbol WNDY. ■ Zipcar Inc., based in Cambridge, operates the world’s largest car-sharing service, with more than 400,000 members who pay for convenient access to a fleet of 7,000 vehicles. ■ BG Medicine Inc. is a Waltham company developing blood tests for heart disease and multiple sclerosis. ■ GlassHouse Technologies Inc. of Framingham is a consultancy that helps its clients manage corporate data centers. ■ Ameresco Inc., also based in Framingham, helps customers manage their energy usage. Of BG Medicine, Steve Dickman of the consulting firm CBT Advisors notes that the company’s tests haven’t yet won approval to be sold in the United States or Canada. “It’s a very promising technology platform, but it’s wishful thinking that they will be able to go public without significant revenue,’’ he wrote in an e-mail. And Ethan Zindler, an analyst at Bloomberg New Energy Finance, said First Wind may also have a tough time. You can read the rest of Scott’s article here. There was a time not long ago when no amount of persuasion could have made most venture capitalists do a diagnostics deal. The reasons abounded: markets were too limited; margins were too low; and the number of potential acquirers too small. So imagine our surprise when the most upbeat session of this year’s c21 investor conference in late May was a panel discussion focused on – you guessed it – molecular diagnostics. If this is not a feeding frenzy, then at least it seems to be a period of high marketability for private diagnostics companies seeking acquisition exits. Session chair Bill Kreidel of Ferghana Partners described four sell side diagnostics assignments his firm is working on for which multiple bidders had appeared. What sells? Proprietary content, improvements in speed or sensitivity/specificity, robust datasets, and large markets. Who are the buyers? Clinical labs like Labcorp, naturally, but also instrumentation companies and companies in the imaging business like General Electric that “see diagnostics cannibalizing some of their revenue” and are trying to capture it back, said panelist Dion Madsen of Physic Ventures. To read the rest of today’s post, visit In Vivo Blog here.